The Target Facebook page will keep you updated on seasonal sales and coupons on specific items. I was also impressed with the giveaways they promote on their Facebook page like a free pastry with any Starbucks grande or venti at any Target Starbucks store. I also laughed at the "Target Truths" which are quite witty. My favorite: "Just walked through the bedding aisle. Whoever counts all those threads - consider us impressed." The Target Twitter feed is also worth following to score freebies. A great example is the recent Twilight Breaking Dawn Part II Twitter trivia contest where they gave away a bunch of cool goodies to Twilight fans. They also update their feed with exclusive money saving Target coupons. It is also worth noting that the free Target iPhone App is a must as it allows you to plan future shopping trips with 'TargetLists', check the best deals with the 'Daily Deals' section, and quickly check prices with the very cool 'Barcode Scanner'. It is a must have if you are a loyal Target customer. If we currently have a Target coupon code available, then you will enter it on the "Payment Method" page when checking out. 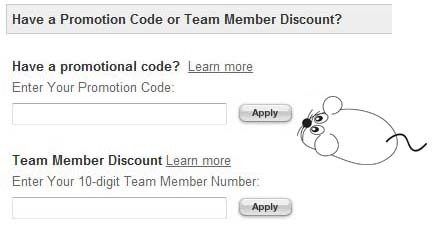 Just look for the section called "Have a Promotion Code or Team Member Discount? ", enter your promotion code and click on Apply. Then check to make sure your discount was received before you proceed. When shopping in-store at Target, learn what the actual price of products means to you by reading Retailer’s Big Secret: Crack the Price Tag Code. They use an internal pricing system which can tell you if the item is at the lowest price or if it might go even lower.